Mate Batarilo was an eight-year-old lad when he first went fishing in the La Trobe River at Noojee. Leaving empty handed, his family stopped by at the local Noojee trout farm to avoid disappointment and ensure a feed for dinner. Little did the young Mate (pronounced Matt) realise that the west Gippsland farm, which he continued to visit for years with family and mates, would be his home and business four decades later. "Even if you'd told me six months before I bought it that I'd be running this place I'd have said you were crazy," said the 50-year-old keen fisherman. "I didn't have an inkling about it. No thoughts on buying it at all." It was only five years ago, when his nephew Michael spied that the farm was for sale that Mate, his brother David and Michael attended the auction and snapped it up on the spur of the moment for a relative bargain. "The farm has been running for 38 years, but a consortium had owned it for three years and it had become run down and hadn't been run properly," said Mate who also runs a welding steel engineering business in Melbourne. "We saw an opportunity to build the business up. The worst-case scenario would be that it was just a holiday house." 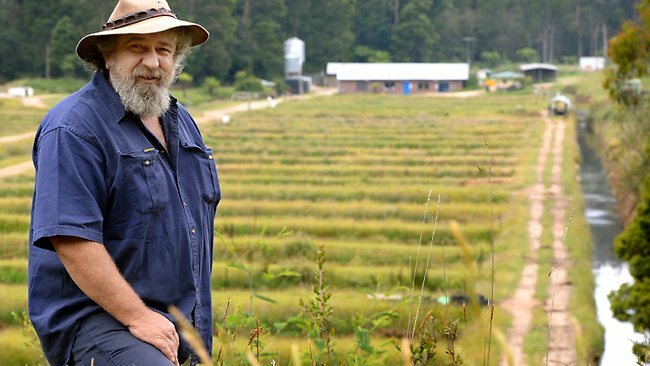 The three purchased 8ha and 58 ponds, which stocked five tonnes of fish, and have since transformed every aspect of the Alpine Trout Farm Noojee into a lucrative business. While they are still learning, and expanding, they currently stock 140 tonnes of trout (about two million fish). They are sold whole, in fillets, smoked and as caviar to the Melbourne and Sydney fish markets, as well as to their biggest buyer, Costco – and with a new export market to Hong Kong, which takes about 40 per cent of fish. The Batarilos hire 17 staff and have a small percentage of sales through their own farm, which is open to the public seven days a week for fishing. The first hurdle Mate tackled was rebuilding the 58 ponds, draining them, applying a clay base and then building the banks to avoid fish escaping from one pond to the next. Each pond can handle up to 4.5 tonnes of fish, but the Batarilos maintain much less at 2.5 tonnes, which is a key farming philosophy to ensure low stocking density and low stress on the fish. It's a philosophy reflected in their mortality rate of about eight fish a day, very low considering the massive numbers they work with. Mate said the water was cooler than other trout farms, at about 18C, which also ensured happier trout. The farm has a water entitlement of 75 megalitres a day, of which they only use roughly half, diverting water from the La Trobe River, running it through the ponds to supply oxygen to the fish, before releasing it back to the river again. Once a month, the EPA visits to test water nutrients coming in and being released. In their first year in the business, the trio bought 1.4 million fish eggs from Tasmania, but in their second year they created their own hatchery and have since been self-sufficient. Each season Mate said breeders are put aside – about 1.8 million fingerlings are scooped in nets and weighed. "We measure roughly. About 100 fingerlings, each weighing 10-12 grams, is about a kilogram – that's what we use as the basis of measurement," he said. These breeders are put in a dedicated breeding pond and when they are about 2 1/2 years old are further selected for breeding. Between April and June about 2000 male and female fish are manually milked for eggs and sperm, which is stirred "like mad" in a bucket, a skill which the Batarilos were taught from a Tasmanian grower. The number of eggs in a female trout can vary markedly, between 200 to 5000. Buckets are then sent to indoor temperature-controlled incubators for roughly three months, with hatchlings then sent to troughs for about four months. Then they are sent to ponds before exposed to various feeding regimens to control growth, fed on natural pallets. "Some customers want 300g whole trouts, others want 1kg and some want 600g fillets. It all varies so that's why we vary the feeding," Mate said. "The hardest part is getting a trout to 100g, that can take a year. But once they're 100g you can get it to 1kg in four months. "For that reason I have fish on the farm that are two years old and weigh 50g but other two year olds that weigh 2.5kg." He said feed-conversion rate was 1kg of feed to 1kg of meat. "It's a bit of an art feeding fish. You can tell how hungry they are but it takes a little while to understand that. Not everyone who works here can be a feeder." The farm has so far had no need for antibiotics, a fact Mate attributes to the low stocking density, low stress philosophy, while cleanliness and biosecurity were ensured by quarantining public access to specific dams. Peak season sees up to 400 visitors a day, with entry and fishing rods free. When it comes time to process, fish size varies widely – from 250g up to 1kg. Fish are processed in the farm's new 500sqm on-site facility, opened in November last year, thanks in part to a State Government grant. The facility features a $500,000 gutting machine, a $70,000 filleting machine, as well as two smokers and a packaging facility. Once caught in nets, fish are stunned with electricity, before being processed whole or filleted, with between 2.5-4 tonnes processed in a day. About 3000 fish a week are smoked in "top secret" methods using no additives and starting with a salt brine. This year, about one tonne of caviar will be processed. It is sold in 50g and 5kg buckets, both wholesale and retail. Mate said the farm could produce up to 350 tonnes of trout a year, but he wanted to cap it below that to ensure low stocking densities. Growth, he predicted, would include the construction of a cafe next year. Mate, who is of Croatian descent, for two decades worked as a builder before owning two commercial chicken meat farms, firstly in Gippsland's Tynong North, and later in Meredith, which farmed 200,000 chickens and which he only sold three years ago. 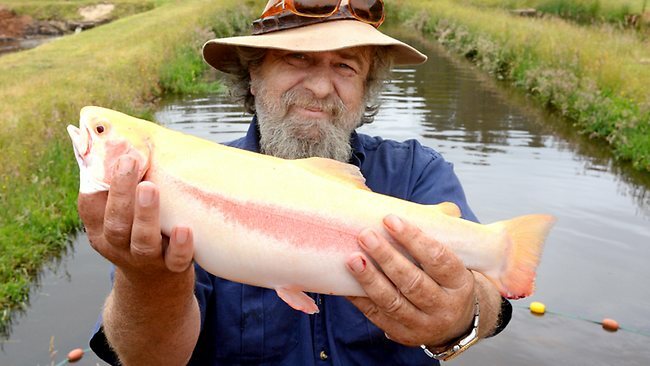 Despite now owning a fish farm, Mate still goes fresh and salt water fishing each month. "I won't let my mates fish on the farm. We all go to the river because this is too easy."